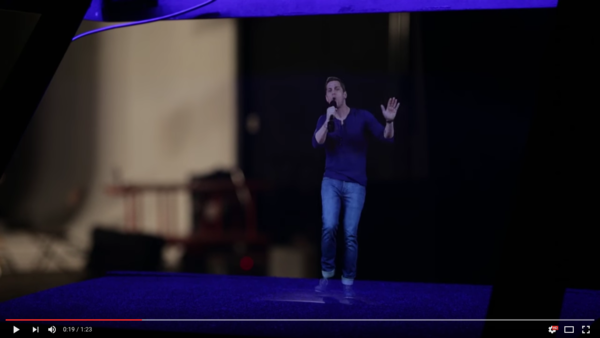 LOS ANGELES, CA – June 23, 2016 — Social augmented reality company, VNTANA, today announced the creation of the first interactive hologram karaoke fan experience to go on tour with multiple-GRAMMY® Award- winning singer and songwriter Rob Thomas. As a part of the tour’s VIP Package, fans can select one of three songs to perform as a hologram duet with Thomas’ hologram, including the new single, Pieces from Thomas’ 3 rd solo album THE GREAT UNKNOWN as well as other favorites One Shot and This is How A Heart Breaks. Fan engagement is a key component in music culture and essential for artists to help create personal experiences for their fans, however, accessibility to artists has recently raised concerns and challenged artists to come up with new ways to engage with fans. Rob was keen to continue to offer his fans a one-on- one experience, and worked with VNTANA to create a virtual meet and greet that still offered close engagement. What can fans expect to see during their HOLLAGRAM karaoke experience? - Fans stand in front of VNTANA’s custom display and within seconds see their own hologram LIVE next to Rob Thomas’ hologram. - As they both appear “on stage,” Thomas’ charismatic hologram invites them to sing a duet with him. - After the hologram performance is done, each fan will receive a video of the experience that they can immediately share with friends and family on social media. Don't miss out on your chance to Win 2 Tickets to see Rob Thomas on his 2016 Tour via the fine folks at Tunespeak. Click here for details.